When choosing Caribbean sailing charters, making an informed decision in order to find a reliable company is the most important task regardless of the amount of money you have at your disposal or the type of chartering service you require. For this purpose, however, a number of questions need to be answered. 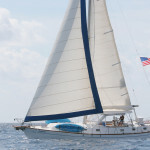 It is not always difficult to choose between bareboat and crewed sailing charters, as despite the obvious advantages of getting a boat all to yourself that a bareboat charter can provide; the responsibility of sailing without being supervised can take its toll, especially if you’re not an experienced sailor. Taking a course is extremely important in this regard, as you need to know precisely how the tides and winds can affect a small boat and what to do in an emergency situation. A crewed charter service, however, is somewhat like a hotel on the water. You get your own sailboat with separate crew quarters, as well as a captain and a cook who will take care of everything while you and your friends or family take it easy and relax. Is It a Good Idea to Choose a Broker? The answer to this question may differ depending on the price involved and whether or not the broker is reliable. A good broker will be able to do all the work for you, providing information on the location of the charter, as well as the itinerary, food, pricing and the experience of the crew. By doing some research on various charting companies, however, you can avoid paying for a broker if you keep a few important factors in mind, such as how experienced a company is, how old are the yachts, how many chartering services there are in a certain location and how do their prices compare against the standard costs. It is generally considered to be a better choice to find this information without the help of a broker. You may do this on the internet by looking up companies on review sites, getting in touch with past customers on specialty forums and contacting Caribbean sailing charters directly.